Today is the first time in ten years I will not be beginning a semester at UMW —and that number is 20 years if you count CUNY and UCLA. I’ve spent a long, long time in higher ed, and I’ve always been a fan of the beginning of the semester, seemed to be filled with so much promise and possibility. That said, I am enjoying the fact that on day one of Spring semester at Reclaim Hosting I am entirely caught up and my plate is clear. A great way to start the year, even if it cannot last. One of the projects Reclaim Hosting has taken on over the last few months is migrating and hosting Virginia Commonwealth University’s WordPress Multisite install Rampages. The site is one of the biggest multisite installs running at a university I know of, with more than 12,000 users and almost as many sites—it’s massive. What’s more, it has grown at an exponential rate over the last two years, and it shows no signs of slowing. Tim has led the charge migrating and customizing this install to deal with the resource demands of scaling such a site. I hope we can provide a more detailed explanation of how he set it up, but it’s still being tweaked and balanced for performance, so we (royal for Tim) will have our hands full with that early this semester. While trying to gauge the setup and the demands on such a system, I was looking through some of the historical traffic we got on UMW Blogs over the last six years, and once I got into it I couldn’t help myself. I’ve been pretty good about letting the work I’ve done at UMW go. In fact, it was fairly easy given the group I worked with is entirely gone now. But one thing we theorized about in 2013 and 2014 was the idea that UMW Blogs role would wane with the advent of UMW Domains. It makes sense, right? The more folks you have getting their own web hosting and domains, the less that need a blogging platform like UMW Blogs. So, given I have the historical data for UMW Blogs in Google Analytics, I ran a quick comparison year over year from 2010 through 2015 measuring the number of sessions,* users, and pageviews for each year to test this theory. Update: Previous graph was had sessions and users mislabeled, that is now fixed. Turns out that the year we started Domain of One’s Own was the biggest year for pageviews on UMW Blogs historically. And while there was a slight dip in 2014 for users and sessions (with a bigger decline in pageviews), that was not true in 2015. 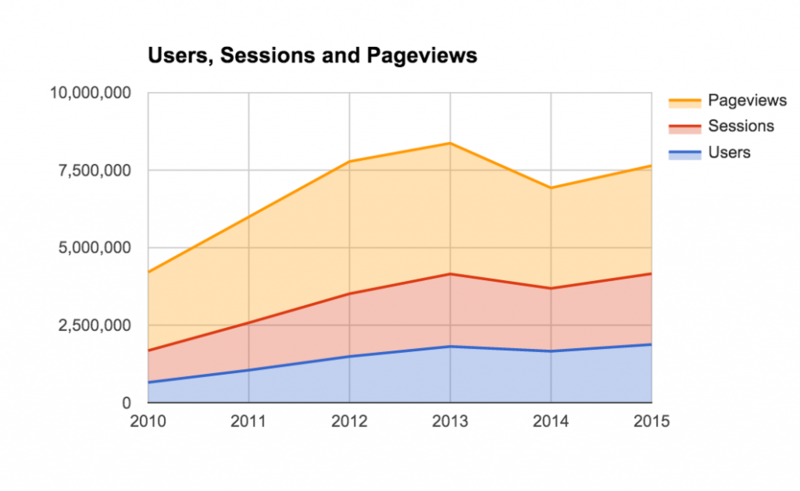 In fact, the number of sessions and users were both the highest on record, and the number of pageviews was up by more than 260K. 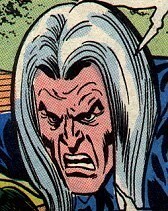 So, there goes the theory that UMW Domains would cut significantly into the usage of UMW Blogs. It may not have grown as much as it did from 2010-2013, but it has not declined significantly either. Interesting. One of the things it points to right away is that there seems to be more than enough demand for both. I have no idea what the future will bring to this system, and I am officially off the case. Nonetheless, the numbers provide one testament to this platform that for more than 8 years has proved to be a remarkable open resource. And if we look at just the last 6 years it has served for almost 9 million users who had more than 11 million sessions resulting in 20+ million pageviews. That’s a lot of fish. *Sessions includes repeating visitors from the same IP, whereas users is a distinct user. This entry was posted in UMW Blogs, umw domains and tagged stats, umwblogs, umwdomains. Bookmark the permalink. Those stats at the end!! Wow!! Actually, as an addendum to this post, I started looking at traffic by city, and that provides a series of data that actually adds a different view of these stats. It’s fascinating, I’ll try and blog some of it shortly.